With this module, Maxsurf provides tools for quickly predicting the resistance of a ship hull using a choice of tank testing regression methods or an analytical Slender Body method. The user is given many options and instant feedback indicating which method is best suited for the hull type being analyzed. 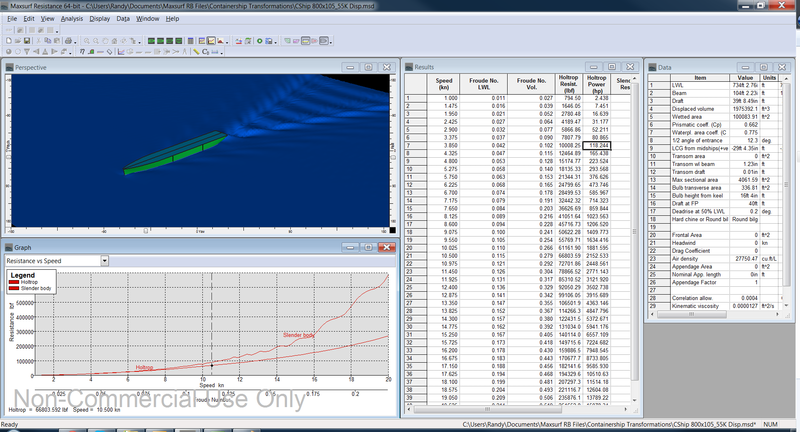 With Maxsurf Resistance, the Naval Architect has a powerful tool for getting quick answers using proven methods without manual calculations. Easy set-up: Maxsurf models are read in and automatically measured to obtain the required parameters, or the parameters may be entered by hand without the need for an existing Maxsurf design file. If the overall efficiency of the propulsion can be estimated, the power requirements of the design can be predicted for several ranges of speed. 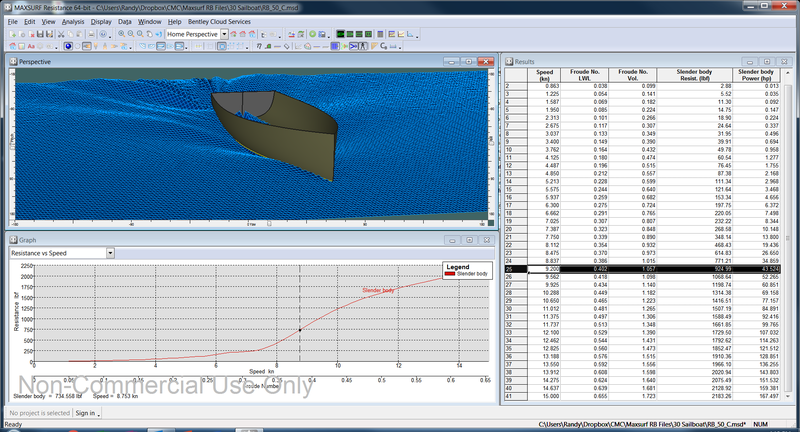 The screen below shows the choice of methods for various hull types, results of input data measured from the NURBS model, and plotting of resistance results. Note in the center for each resistance prediction method used for this analysis, the user is provided with instant feedback warning if the vessel parameters are high or low (outside) of the range of applicability for calculating reasonable results. The user is also able to edit any parameter of the data input in the above window, thereby providing instant feedback incrementally to gain insight into how that parameter can affect the resistance. Many different approaches exist to predict the resistance of a vessel. Maxsurf Resistance implements several different resistance prediction algorithms, each applicable to various families of hull shapes. For example, some of the algorithms are useful for estimating the resistance of planing hulls, while others are useful for estimating the resistance of tugs, trawlers, barges, or sailing yachts. 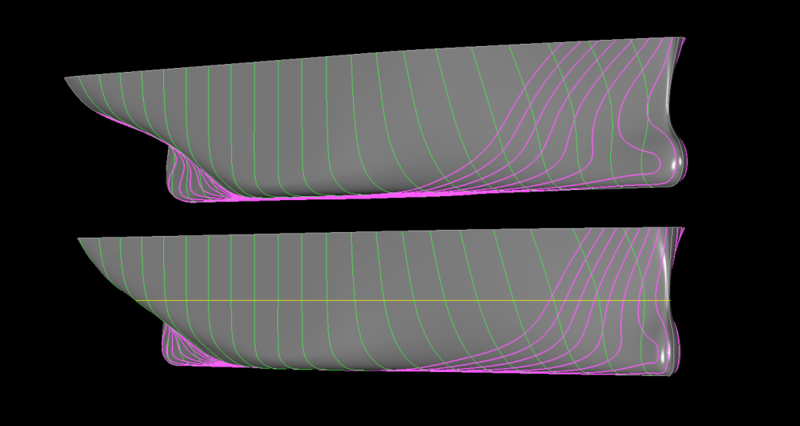 Results are obtained very quickly, enabling a Naval Architect to gain valuable insights on how certain hull form changes with effect power requirements. Designs can be optimized with less guessing and more analysis in a fraction of the time. 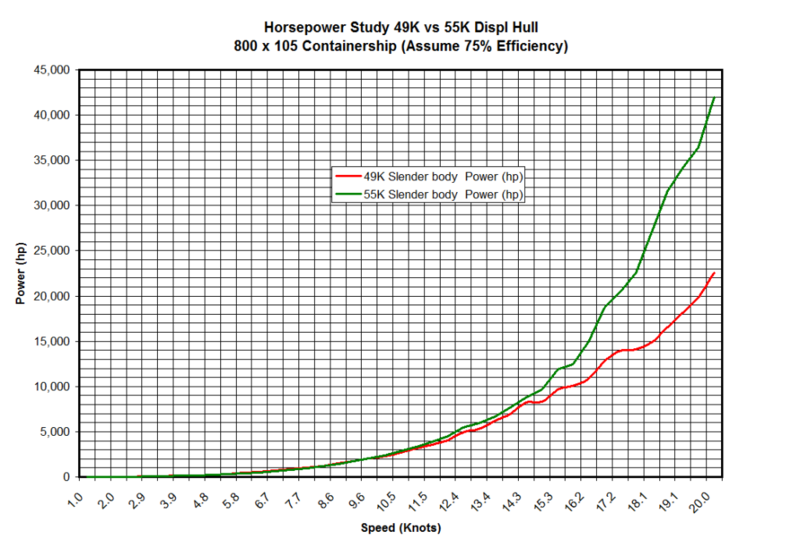 For example, this parametric study used MAXSURF Modeler’s Parametric Transformation tool to increase the cargo carrying displacement of a 800′ containership from 49K to 55K tons after increasing the Block Coefficient. How this change affects resistance is plotted below. In this example, the changes and the results were completed in 10 minutes. To see this in action, click the link below. Link to You-Tube Demo of Parametric Transformation and Resistance. The resistance and power results can be easily copied to an Excel spreadsheet or word processor for further analysis and formatting for reports (see below). 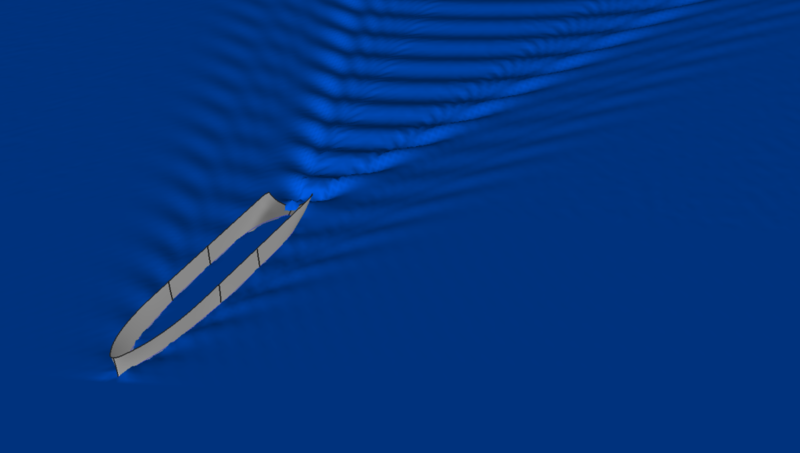 Besides resistance prediction, Maxsurf Resistance can also be used to calculate the still-water wave pattern generated by the vessel for a given velocity. These patterns can be scaled, rendered, and viewed with different lighting combinations from any angle providing the user with additional insights into vessel performance. The only 100% accurate way of determining resistance of a vessel is to build a full-size hull and measure the actual resistance with a tow cable. Since this is impractical, the Naval Architect is left with having to carefully select the appropriate methods and tools to predict resistance. Maxsurf Resistance has a well written 71 page user manual for a reason – to guide the Naval Architect to use the tool wisely, and obtain reasonable results quickly.